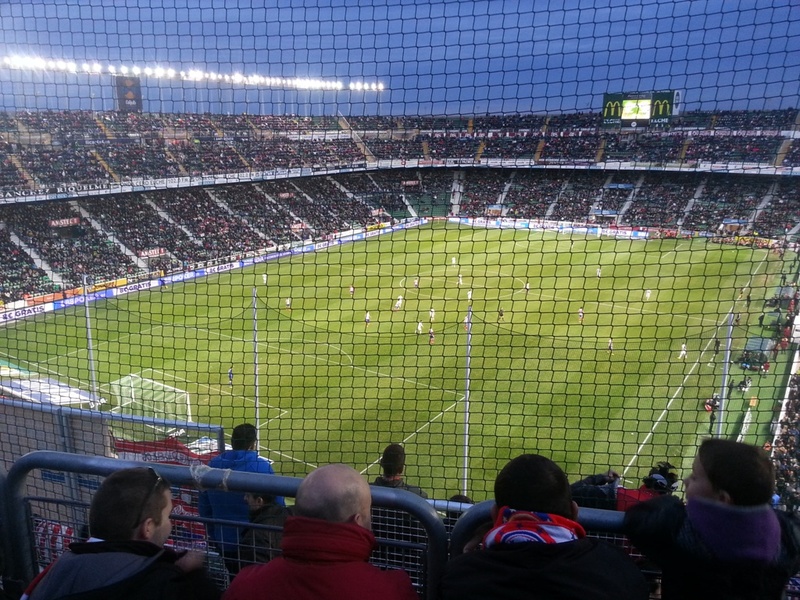 When his beloved Bromley had a football free Saturday, @WillBains took the opportunity to travel to Spain and watch Atletico Madrid v Elche. Here, he tells El Centrocampista about his trip. Bromley’s early exit from the FA Trophy resulted in another empty Saturday in relatively quick succession. First choice for me was to go and watch a team I support, and I saw that Atlético were away to Elche on Saturday afternoon. The day trip was therefore possible, so I looked up flights and booked a return for £65. Bargain. The day started with a flight from Gatwick to Alicante at 7.55am. While waiting by the gate in Gatwick, a man had spotted my Atlético scarf and asked how I would be getting to the game once in Spain. A football conversation duly followed and it turned out that he was actually a former Dorchester Town manager who was now a scout. It also turned out that he wasn’t the only scout on our flight as he noticed another who was also going to the match. A strong tailwind and a taxi straight from the airport meant that we got to the centre of Alicante at about 11.30am Spanish time. This offered us a couple of hours to explore the town and beach before catching the train over to Elche. 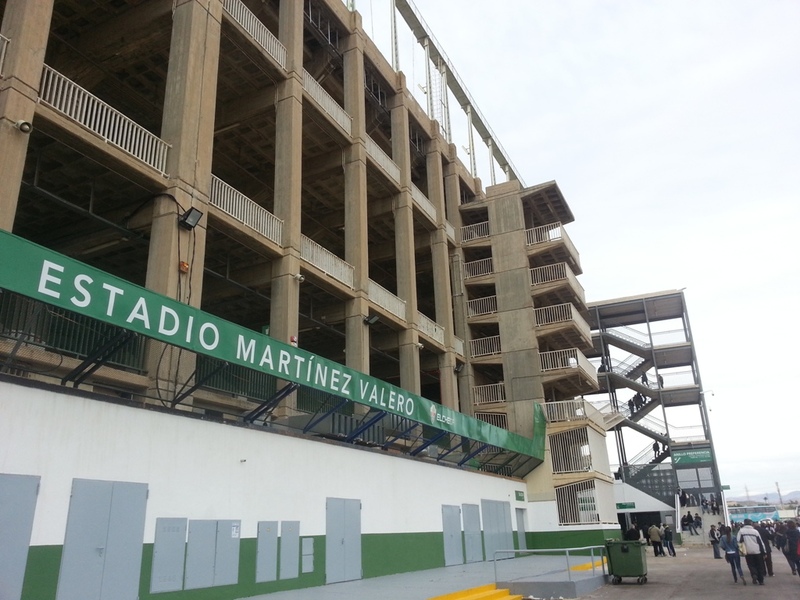 Following a slightly stressful ticket-buying experience at the train station where none of the ticket machines accepted cash, we arrived in Elche a couple of hours before kick off and took a cab straight from the station to the Manuel Martínez Valero stadium. 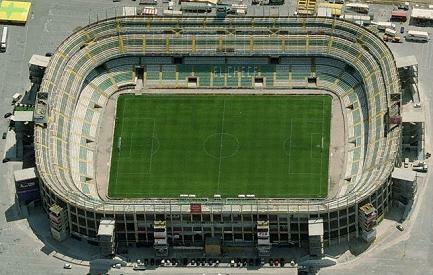 The ground itself is on the eastern edge of Elche and as a result is fairly isolated. There are certainly none of the small streets with bars full of football fans that can be found at many other grounds in Spain (even Getafe). I was therefore very pleasantly surprised to find that there were all sorts of small bar areas in between the different turnstile entrances to the stadium. We decided to take advantage of the facilities available and went for a beer and bocadillo for €4.50, which seemed like very good value to me. We purchased our match tickets from one of the ticket windows at the ground and made our way inside. The away section of the 38,000 capacity stadium is high up in one of the corners and comes complete with a large amount of netting to prevent objects being thrown onto the pitch. I feared that watching the entire game through netting could get quite annoying as the match progressed, but I soon got used to it. 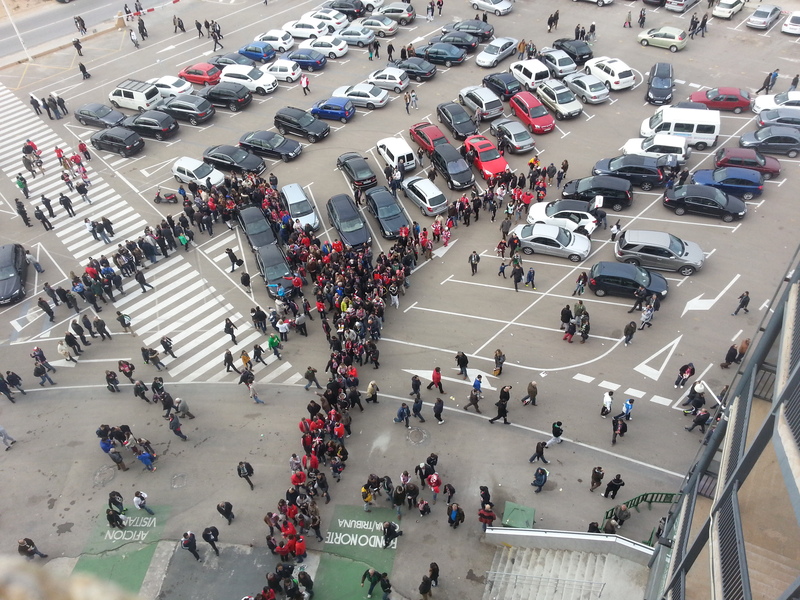 Something that had struck me while walking round the outside of the stadium was the number of Atlético fans that I encountered. I’d estimate that there were about two or three thousand away fans, which is considerably more than I was expecting. There is less of a culture of going to an away game in Spain, but the Atlético fans had certainly turned out in force for this one. With such a large contingent of away supporters, I was unsure what to expect from the atmosphere. Everything seemed pretty friendly and wasn’t particularly hostile. The vast majority of the Atlético fans were joining in with the various chants that were pretty constant throughout the match. I also joined in with the few that I know and can pronounce in the correct rhythm, and it was quite refreshing to see a group of football fans constantly chanting support for their team rather than simply hurling abuse at the opposition. The match itself was not a particularly memorable one. 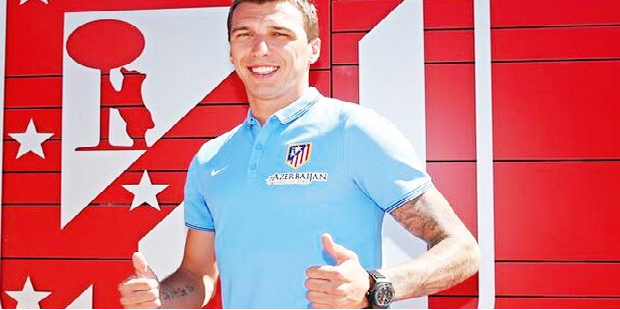 Atlético always looked like the stronger side and I was surprised that it was still 0-0 at half time. That changed in the second half though when the away side scored a scrappy goal just after the hour mark. The goal was scored down at the other end of the ground, so we couldn’t really see what was going on (perhaps due to that netting) and even had to look up who had scored on the way home. There was no doubt about who scored the second though. Diego Costa finished superbly when played through to make the points safe. After the game, we walked back towards the centre of town to get a taxi back to the airport. After watching most of the match between Real Madrid and Valladolid at a bar in the airport, we took the 9.50pm Norwegian flight back to Gatwick. Free Wi-Fi on the brand new plane was an excellent end to the day – particularly as it allowed us to catch up on all the football scores that we had missed. The day as a whole was a pretty tiring one and I think the fact it was a couple of hours longer than my recent Madrid trip made a considerable difference. Nevertheless it was still hugely enjoyable and I thoroughly recommend one of these ridiculous European day trips to any football fan.